Cut, shape, customize, fasten, laminate, fabricate, install. Printing is just part of what we do. With all the care we put into our printing, your work wouldn’t look good and work well without our outstanding custom finishing department. Your imagination and our precision has kept us going for decades, ensuring your graphics match your vision. We are your one-stop-shop for mounting & laminating. Our wide range of mounting substrates and over laminates will finish and protect your graphic displays. Lamination services are clean and bubble free, using several finish options to customize your work. 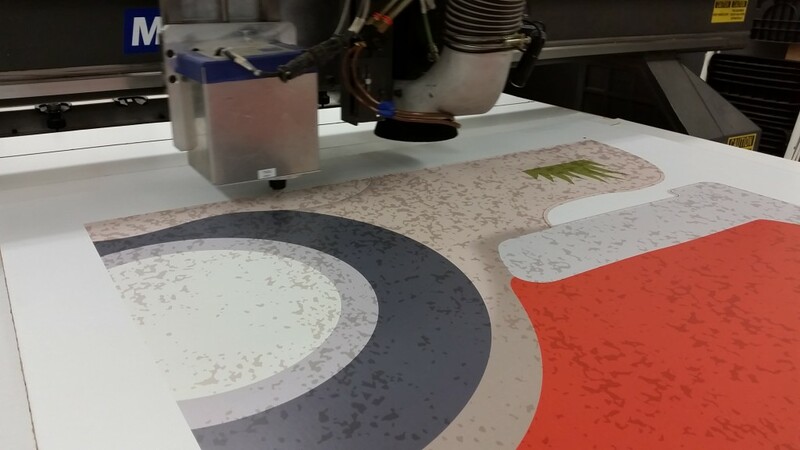 We can mount and laminate up to 62″ wide, both top surface and second surface. Our Multi-Cam router/cutter handles up to 5×10’ material and uses a unique vision system to ensure the cutting is as accurate as your artwork. Like our front end, our custom cutting is optimized for quality over speed and capacity, resulting in clean, finished edges; repeatable precision. In addition, we have comprehensive packaging and fulfillment capabilities throughout North America. The highlight of our finishing service is our custom fabrication and installation. Our department head, Rob, has been with us for over 25 years and uses his experience and precision to turn your creativity into reality. 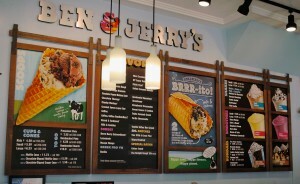 Ben & Jerry’s came to Light-Works requiring a new menu board system for all its North American scoop shops. For years, they had been using a backlit system with magnetic flavor strips and wanted a completely new look to match their new store design and a more effective method to display their brand and swap out the content. They needed us to turn the concept into something that would be cost effect to produce, ship, and change out content. The materials needed to be authentic, made in Vermont, and of course using sustainable material wherever possible. We suggested using Visual Magnetics to use recyclable material instead of PVC and to save significantly on shipping weight. The frames would be made from local pine; stained, finished, cut and assembled under our care. The hanging system, to resemble sliding barn doors would be fabricated locally as well. It all had to be UPS shippable, and demonstrate cost saving over the legacy system, particularly for content change outs. Light-Works produced the complete five panel system and shipped them system wide to their scoop shops.